The SBM Jollof index is a composite index that tracks the prices of the main ingredients used to prepare a pot of one of Nigeria’s primary delicacies – Jollof rice, for a family of six. This meal was selected because it has the near unrivalled distinction of being a delicacy in every part of the country. 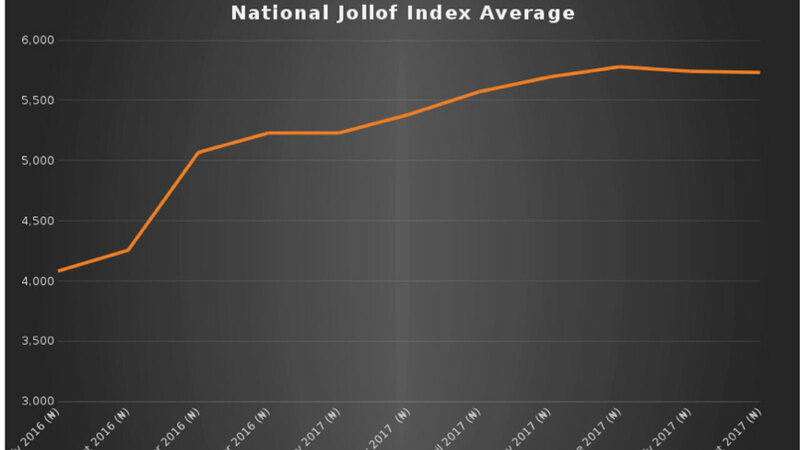 This is the third Jollof Index and we believe that it gives a bird eye’s picture of national inflationary trends. Nigeria emerged from recession in Q2 2017 with the economy expanding 0.55 per cent year-on-year. However, despite the end of the recession, inflation is still very high. There is a ray of hope as figures from the National Bureau of Statistics figures released earlier this month showed that annual inflation slowed for a seventh straight month, easing to 16.01 per cent. This has translated to relatively stable food prices as compared to our previous indices when prices kept rising sharply. While prices are still very high for the average man on the street, many respondents to our survey expressed hope that in the coming quarter, food prices will drop even further as a result of the harvesting season. For this index, we have introduced a new city into our Jollof Index, the city of Calabar, in Nigeria’s South-South geopolitical zone. The trend there for a pot of jollof rice has been stable in the three months that we have gathered data from there. SBM’s tally of these prices has been ongoing since the second half of 2016, and while there were sharp increases in the average price quarter-on-quarter, the last quarter seems to suggest a levelling out, and in a few cases, a decline, in the cost of a preparing a pot of jollof across the country. The declines in a few geopolitical zones were sufficient enough to bring down the average cost of preparing a pot of jollof rice month-on-month across the country. In June it was ₦5,784, in July it was ₦5.746, and in August, it was ₦5,736. Kano still remains the most expensive place to make a pot of jollof rice nationally, coming in at ₦7,440 per pot, while Awka and Onitsha, tied at ₦5,160, are the cheapest. For hard pressed commuters and residents in Nigeria’s commercial capital, Lagos, a pot of the meal now costs ₦5,390 on average. In the country’s political capital, federal employees can expect to get their jollof fix at ₦5,970 if the cooking ingredients are obtained from Wuse, the closest major market to the Federal Secretariat and Central Area, where most federal establishments are head-quartered. Prices retained their somewhat elevated levels in both Wuse and Nyanya, even though they did not rise or fall in the period under review. It is worth noting that unusually high rainfall, which led to some flooding in the neighbouring agrarian states of Benue, Kogi and Nasarawa, while not impacting food prices in the review period, may begin to turn the needle in an inflationary direction as the year draws to a close. Incidences of localised violence and other security challenges in the main food growing regions of the country continue to remain a concern from a consumer standpoint and will need to be closely monitored and addressed if consumers are to experience any relief at the checkout point. 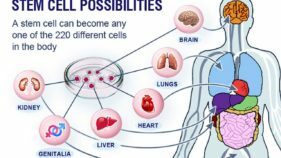 While there is some reason to be upbeat, the overall outlook remains tricky and caution is advised. As we observed in previous two Jollof index debriefs, the Nigerian consumer remains constrained by a host of well-documented factors. We are not out of the woods yet. The recession may be over, but growth is still anaemic, and the factors which got the economy in a negative trend in the first place still persist. In brutal terms, while GDP is still an appropriate and relevant measure to determine the ebbs and flows of economic growth a full recovery will have to take into account the effects of the negative quarters. The end of the recession has not yet seen companies recall people who were laid off, and wages are still being delayed, or in some cases, not paid at all. The accompanying economic angst has shown up in the news in the form of workers strikes by a bevy of trade unions over the last three months. 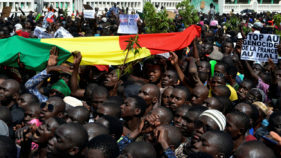 Another causative factor of rising food prices, unrest in key farming regions, has been, for now, mitigated by the rainy season and the harvests, which follow. 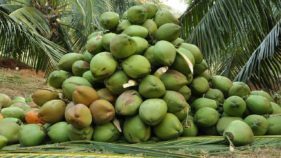 The country, for example, should see a bumper cocoa harvest in the coming season as late rains have helped boost pod production. 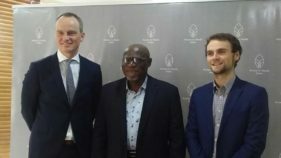 The Cocoa Association of Nigeria expects output for the new season which starts in October to hit between 300,000 tonnes and 320,000 tonnes, up sharply from a 2016 season which was blighted by poor weather as a long dry spell that following near record rainfall wasn’t broken by the intermittent rains that would have helped the development of buds. Despite the drop in food prices, it is not time for policy makers to pat themselves on the back over a job well-done. Indeed, the job has not yet been done. Addressing the country’s rickety infrastructure will play a critical role in easing the logistical challenges all economic participants in the food industry currently face. Aid to farmers can, and should ensure standardisation and yield improvements in the farming practices. There is also a need for more investment in agricultural extension programmes to ensure that farmers – a full 30 percent of the population – imbibe 21st Century practices and increase the average yield per crop per land cultivated. Finally, the government’s foreign exchange policy, which has seen some stability in the FX market over the last few months, still needs to be reviewed. While the various currency rates have generally moved towards convergence – bringing some relief to suppliers and importers, more needs to be done to prevent the turmoil of the last few quarters from repeating itself, and impacting on the pockets of Nigerian consumers.